I was compensated for this post with a Clothing Cove gift card. All opinions expressed are my own — especially when I say this store rocks. Because it does! Ladies…I can’t be alone. I have been every size from 6 up to 14 in the past 10 years and have worn every style of pants possible, and I still don’t have a single pair of pants that fit correctly. Being 8 months postpartum hasn’t helped at all. Suffice to say, this event sounds like something I need to attend! 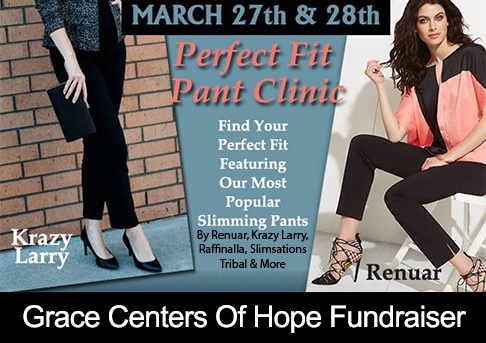 The Clothing Cove, in charming downtown Milford, Michigan, is hosting a pant clinic this weekend, March 27-28 to put a positive spin on the elusive search for a great fitting pair of pants. For every customer who tries on a perfect fit pant, $2 will be donated to Pontiac-based Grace Centers of Hope to fight against homelessness and human trafficking. If you aren’t familiar, Grace Centers of Hope is an amazing rehabilitation center that has been helping men and women in Pontiac since 1942. They shelter anywhere from 150-200 people a night and serve about 100,000 meals a year. Grace Centers also partners with the non-profit All Worthy of Love to fight against human trafficking in Detroit. Fantastic cause, amiright? For the Clothing Cove pant clinic, sales associates will be ready to help fit the skinny, straight, curvy and every customer in between with a wide selection of missy pants. The collection includes sizes 0 to 24W and features brands selected for their slimming nature, comfort, and durability. Such notable names as Renuar, Krazy Larry, Tribal, Raffinalla, and SlimSation will be shown. 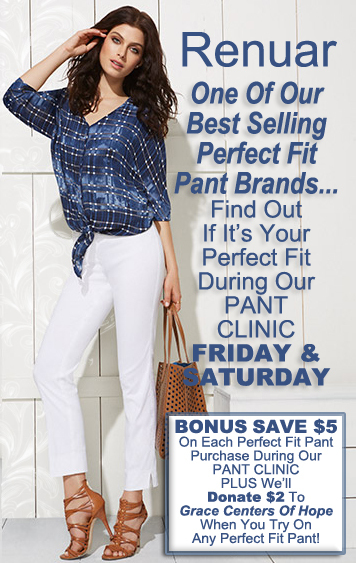 Customers will receive $5 off any perfect fit pant $59+ purchased during the clinic. Anyone who tries a perfect fit pant on will also be entered into a drawing to win one of three FREE pairs of Renuar pants. Additionally, patrons will also receive a 10% off coupon for a future purchase if they bring in gently used clothing to donate to Grace Centers of Hope. Believe me ya’ll — if you would like amazing customer service, you need to support Clothing Cove. They rock it and have an awesome selection of clothing, accessories, formal wear and more! Additionally, I highly suggest making a day of traveling to Milford — not only may the perfect pair of pants be waiting, but also perfect shoes, perfect gifts and the perfect lunch, too 😉 See more about things to see and do in the village here. What is your favorite brand of pants that actually fit?